The Plateau Tip series based on the well-established NANOSENSORS™ Silicon-SPM-Probes exhibit an intentionally blunt tip with a well-defined circular end-face located at the free end of a micromechanical cantilever. 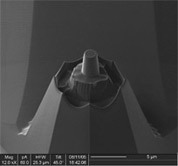 This plateau is formed by focused ion beam milling out of a symmetrically etched tip building a rod on top of a conical tip. 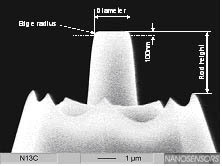 NANOSENSORS™ PL2-CONTR AFM probes are designed for contact mode (repulsive mode) AFM imaging. This probe can also be used for force-distance spectroscopy mode or pulsed force mode (PFM). The CONT type is optimized for high sensitivity due to a low force constant. Upon request customized larger plateau diameters can be realized. Other shapes are also possible upon request.